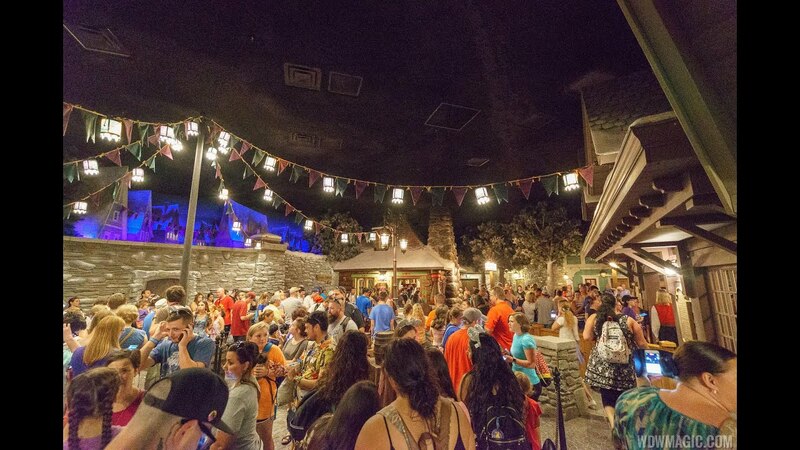 Jul 01, 2016 in "Frozen Ever After"
Frozen Ever After has been open for 10 days now, and as expected, managing wait times continues to be an issue for the operations team at Epcot. Combined with the ride system's low capacity, and high guest demand for the new attraction, the queue continues to snake its way throughout the Norway Pavilion and towards the China Pavilion. These photos were taken just moments after the park opened at 9:10am, and already the standby line had reached 120 minutes. Approaching the Norway Pavilion, you will find three queue entry points. One for standby to Frozen Ever After (although this may actually be further towards China), one for FastPass+, and one for check-in to the Akershus character dining. In each case, look for a cast member holding a sign to make sure you enter the correct queue. Water stations and umbrellas now line the outdoor queue area. For guests fortunate enough to have FastPass+ reservations, recent reports have typically indicated a 10 - 15 minute wait. But frequent breakdowns of the ride have at times resulted in longer waits, or ride times being changed to later in the day. Unlike most attractions, Frozen Ever After did not go through a period of soft opening, and instead went directly into an official opening. Once the various technical issues have been resolved, expect to see fewer interruptions and shorter wait times. Frozen Ever After is open for both morning and evening Extra Magic Hours. There is much better news over at the nearby Royal Sommerhus meet and greet. The exterior overflow queue has been removed and was never used, and wait times are typically in the region of 10 to 20 minutes. FastPass+ is not available, but with the short wait times, meeting Anna and Elsa is no longer a problem.